Install EverLast™ Wall Panels up to 32”, finish with chair rail and trim. At Northern Basement Systems, we can repair the damage to your walls and floor with warrantied products at the same time we waterproof your basement! There's no need to call a separate contractor! 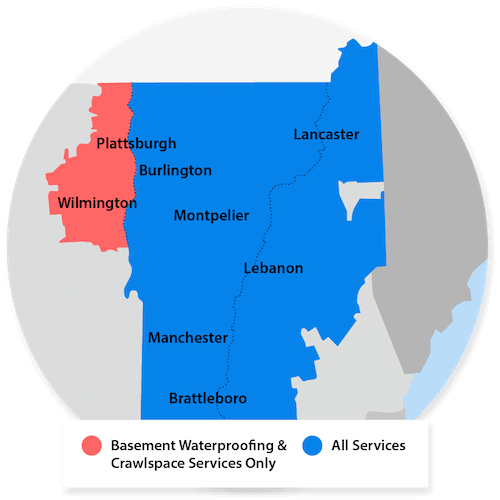 We service Concord, Lebanon, South Woodstock, Hanover, Milton, Berlin, Claremont, Keene, Burlington, Colchester, Laconia, Rutland, Bennington, South Burlington, St Albans, Montpelier, Brattleboro and many nearby areas in Vermont and New Hampshire.